Old Japanese Kutani dishes placed in the carved wood tray. Each dish is hand painted and signed at the bottom, "Gyokuzan". The diameter of the tray is 14 inches. 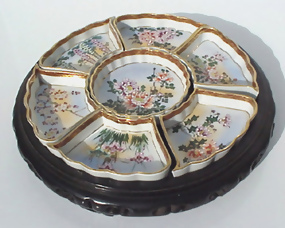 Some gilt wear at the rim of some dishes.